Budget airline Easyjet has expanded further by buying UK carrier GB Airways for £103.5m ($212m). GB Airways currently operates services under the British Airways brand to Southern Europe and North Africa under a franchise agreement with BA. 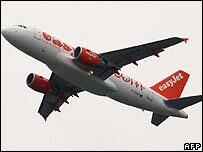 GB services fly from Gatwick, Heathrow and Manchester, although the purchase by Easyjet does not include the Heathrow take-off and landing slots. 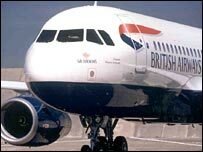 The franchise agreement between BA and GB will come to end in March 2008. GB Airways operates a total of 39 routes - 28 from Gatwick, six from Manchester and five from Heathrow - and has a fleet of 15 Airbus aircraft. Easyjet said the deal was consistent with its expansion strategy and would improve its position at Gatwick. "This is an acquisition which both strengthens our customer offering at London Gatwick, our biggest base with an attractive catchment area, and allows us to fully capitalise on the potential of the airport through a larger number of slots," said Easyjet chief executive Andy Harrison. GB's chief executive Kevin Hatton said the deal brought "an end to a period of uncertainty" about the future direction of the airline. "We will fulfil our outstanding obligation as a franchise partner to British Airways and then look forward to a smooth operational merger with Easyjet," Mr Hatton said. British Airways said it would end its franchise agreement with GB Airways in March 2008 and then intended to start its own services on some of the routes operated under the franchise. "UK franchises have outlived their purpose," said BA chief executive Willie Walsh. "Easyjet has made an offer to buy GB Airways and this has enabled us to end the franchise agreement early. We had an option to buy GB Airways but we rejected it," he added. BA said that the deal between GB Airways and Easyjet was expected to be completed within eight weeks. During this period flights, will operate as normal. When the deal is completed, passengers can either rebook on Easyjet or will be entitled to a full refund. BA also said that it would be ending its franchise agreement with Scottish carrier Loganair from October 2008 and begin a codeshare agreement with the airline.